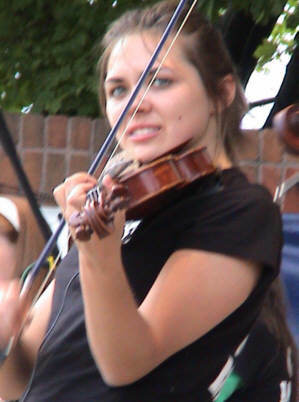 The Celtic Sound of the Chelsea House Orchestra Filled Wenonah Park Last Wednesday. The CHO are all high school students at Chelsea High School in Chelsea, MI. Jed Fritzemeier started Chelsea House Orchestra (CHO) in 1996 with 10 students. 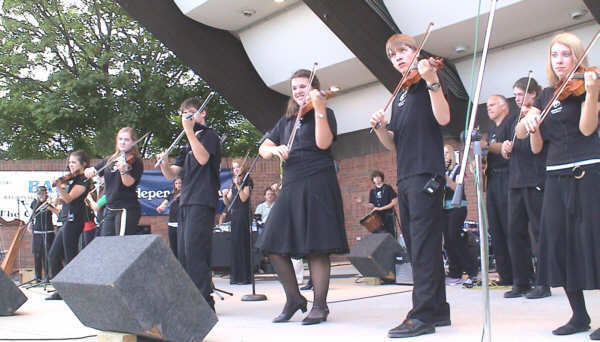 Within 3 years, the group was performing on Celtic Festival stages and fairs throughout the region. Last Wednesday night, CHO performed their magic at the Downtown Bay City Wenonah Park Bandshell for the weekly Bay Arts Council's (BAC)Wednesday in the Park. The CHO members are all high school students at Chelsea High School in Chelsea, Michigan. "It's another glorious night in Bay City," said Joy Butler, Executive Director, Bay Arts Council, as she enjoyed the night's entertainment. Below:(L/R) Flutes and fiddles filled the night air with Celtic Music. Butler went on to say that she was totally pleased with the BAC's line-up of entertainment for 2007. "We have a mix of local, regional and national groups set to perform this summer," Butler said. 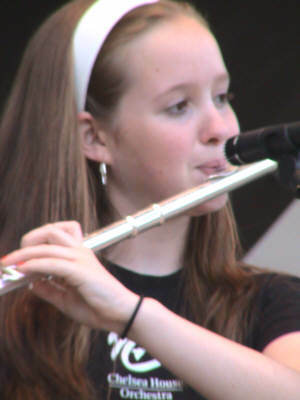 According to CHO Band Director Fritzemeier, CHO attempts to provide a varied and colorful performance repertoire with the majority of the music derived from traditional Celtic sources. "We play 10-12 performances each year," Fritzemeier went on. "The idea is to get the band members to enjoy the music and to explore a musical genre that they might not otherwise be exposed to." Below: (L/R) Band Director Jed Fritzemeier and Bay Arts Council Executive Director Joy Butler pause for a "photo op" during intermission. For a complete list of Wednesday in the Park Events, Click Here.